I am amused and actually a little disturbed that my position is seen to be simultaneously radical — I am advocating the idea that the universe is dominated by an all-pervasive repulsive fluid — and conservative — just jumping on the same bandwagon as my colleagues. In fact, I (we) are just doing science: we’ve made some measurements of the Universe and its constituents. Our simplest theories, that the Universe is dominated by what we could call “normal” matter, simply don’t fit the data, since normal matter requrires that the expansion of the Universe be slowing down (decelerating) over time. Indeed, several different lines of observational argument all lead separately to this contradiction with the simpler theories: the Universe as a whole would be older than the objects in it; distant objects are dimmer; and present-day structures are growing more slowly. These problems and other related ones can be solved if we open up our theories to allow the expansion of the Universe to be accelerating. And how can we implement that idea? What is the physics behind acceleration? Well, the simplest possibility is just to reinstate Einstein’s own “cosmological constant”. Other possibilities are a so-called “scalar field” or even some modifications to Einstein’s theory itself. All of these nowadays fall under the rubric of “dark energy”, originally coined by Mike Turner of the University of Chicago in the 1990s when the evidence for such a concordance model was beginning to grow. I don’t know which of these possibilities is true, nor even whether these ideas will stand the test of time. But despite a decade of attempts to find other explanations for the observations without resorting to dark energy, none have so far succeeded. So that’s why I plumped for Dark Energy — it’s the simplest, perhaps only, explanation of our cosmological observations. 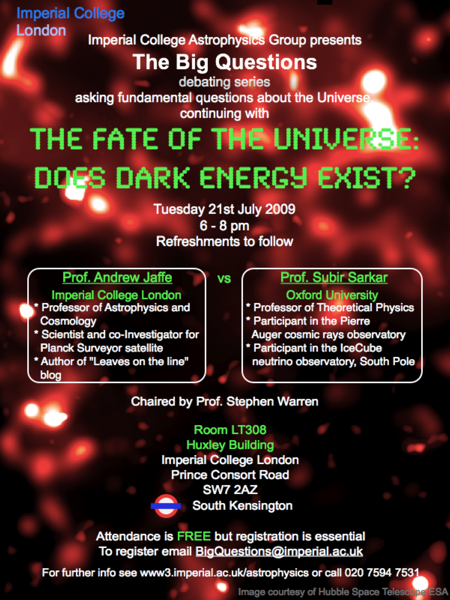 As part of Imperial College Astrophysics’ ongoing series “The Big Questions”, I’ll be in discussion with Subir Sarkar of Oxford here at Imperial on Tuesday, 21 July 2009. We’ll be debating the fate of the Universe, and, more specifically, the existence or otherwise of Dark Energy, which appears to be causing the Universe to accelerate in its expansion. I expect this will be less metaphysical — but perhaps no less contentious! — than the previous debate, between Professor Michael Rowan-Robinson from Imperial and the Rev. Dr John Polkinghorne KBE FRS on “The Origin of the Universe”. Tickets are free, but please register in advance. Congratulations to Joe Zuntz, recipient of Imperial Astrophysics’ latest Doctorate for successfully defending his entertainingly-titled Ph.D. Thesis, “Cosmic Microwave Background Power Spectrum Estimation and Prediction with Curious Methods and Theories”. Joe had been my student since 2004, working on topics from hard-core data analysis with the MAXIPOL team to exploring the repercussions of exotic theories such as the Causal Set idea for unifying quantum mechanics with relativity (which, alas, he has shown is unlikely to be able to match our current observations). Joe has already moved over to a postdoctoral fellowship at Oxford where he is sure to (continue to) prosper. Congratulations, Dr. Z! Congratulations to Dr Brian May, PhD, for successfully defending his PhD thesis, “Radial Velocities in the Zodiacal Dust Cloud”. At the time of his defense, I was up in Durham, lecturing to the mostly younger incoming class of STFC-supported UK grad students. Best of luck to them, too, and let’s hope they can finish before their funding runs out in three or four years and so won’t have to make do with a less interesting career like Brian’s. Combining as it does my vocation with my avocation, it’s impossible to resist an easy post about our favorite rock-star PhD student, especially when he’s made the Guardian’s Leader (aka Editorial) page and the front of the BBC News site (complete with a spiffy pic of the rock star with our new head of group). Less than three nervous weeks for Brian to prepare for his PhD viva! Of course, I should point out that, like parents and their kids, we love all of our students equally, even the ones who haven’t made platinum records, written West End musicals and books on astrophysics, and inspired Wayne’s World. The Zodiacal Light is a fuzzy glow visible in the morning and evening sky, stretching along the line along which the constellations of the zodiac appear — the ecliptic that we now know to be the plane made up of the sun and the orbits of the planets. Observations of the zodiacal light show it to be due to reflections from dust in the plane, dust thought to be mostly the detritus of collisions between and among asteroids, comets, and more distance objects from the Kuiper Belt. This week we in the Imperial astrophysics group were treated to a talk on the zodiacal light by Brian May, the group’s newest postgraduate student (and one of the eldest). Brian started his Imperial PhD in the early 1970s, but decided to leave to play guitar, eventually, on the roof of Buckingham Palace. Last year, he decided to return to astrophysics and, perhaps amazingly, has finished his PhD thesis under the supervision of Michael Rowan-Robinson, the former head of our group and current President of the Royal Astronomical Society. He was actually lucky in his choice of topics: it hasn’t been a major research area since his last astronomical work three and a half decades ago but is coming to the fore again as we start seeing similar dust clouds orbiting distant stars, and as we worry about the obscuring properties of the local dust as we peer through it with ever-more-sensitive instruments, such as the Planck Surveyor. For someone so, um, inexperienced in public speaking (or at least in giving scientific presentations), Brian gave a very good distillation of the history of the field (including the missing 35 years while he was indisposed) including his own work, and his own interpretations speculating that some of the light may be due to our movement through an even larger cloud of interstellar dust. As is customary, we took Brian May (still “Mr. May” until he gets his PhD later in the Summer) out to dinner with members of the group, and he even joined us afterward for a pint at one of our locals. He paid for a round, and he was extremely gracious to the crowds who stared, pointed, and came up to chat. He was also accompanied by his chauffeur, a very nice guy who was also one of the… widest… men I’ve ever seen (and who seemed happy to sit in the very nice Lexus while Brian ate and drank with us). Who would have through astrophysics would give me a taste of the rock’n’roll lifestyle? The Oakland Tribune has an article about Marc Davis, a professor at Berkeley. When I was doing research there, I was lucky to have Marc in the office next door: a brilliant astrophysicist who has done as much as anyone of his generation to understand the large-scale structure of the Universe, he is more recently one of the principal designers of the DEEP survey, mapping the distribution of galaxies as they were when the Universe was less than half its present age. Moreover, Marc certainly didn’t live up (or down) to the stereotype of the pasty, unathletic office-bound scientist — he was ebullient, athletic, charming, driven — but still a nice, lovely guy. In 2003, only fifty years old,Marc suffered a stroke, leaving him paralyzed on his right side. Since then, he has fought back, managing to ski in Lake Tahoe, bicycle up and down the Berkeley hills (and continue pushing his science forward). It’s hard to avoid getting soppy or sentimental when faced with what Marc has gone through, what he’s accomplished, and how far he may still have to go.